Work Sharp Knife & Tool Sharpener Ken Onion Edition. Work Sharp has partnered with legendary hall of fame knife maker Ken Onion to develop a new knife and tool sharpening platform with expanded features! The combination of Work Sharp engineering and Ken Onion’s industrial design has created a fast, easy and stylish way to sharpen all your knives and tools with precision and repeatability. The Work Sharp Knife & Tool Sharpener Ken Onion Edition is designed to sharpen every knife you own. Using a fully adjustable precision sharpening guide (15° to 30° in 1° increments), variable speed and premium 3/4”x 12”flexible abrasive belts it sharpens straight bladed pocket & hunting knives, serrated knives, kitchen knives and any other shape or type of blade you own. Professional blade makers like Ken Onion use flexible belts to put a razor sharp edge on their blades, now you can have the same technology in your home or shop. ‘Work Sharp Engineered and Ken Onion Designed’ to deliver the pinnacle of knife sharpening. The 3/4" x 12” flexible engineered abrasive belts from Norton sharpen not just straight bladed knives, but also curved knives, tanto blades, filet knives, serrated knives and virtually any other shape of knife blade. This Work Sharp Knife Sharpener uses a precision sharpening guide to ensure that you get a consistent angle every time. The sharpening guide is fully adjustable in 1° increments from 15° to 30° so you can sharpen any knife to the angle you desire to best meet your needs. The variable speed control (1200 SFM to 2800 SFM) proides you with the optimal belt speed for the task athand. This combination of flexible belts, variable speed and a precision guide lets you sharpen your blade to hair popping results with speed, ease and repeatability. This is the fastest and easiest way to get your knives as sharp as youneed them to be. Stop tolerating dull knives and time consuming sharpening ethods! Professional knife makers. like Ken Onion use flexible belts to put a razor sharp edge on their blades, and now you can have the same technology to use any time your knives get dull. You may already have other sharpening methods, but never before has a knife sharpener been able to quickly and easily sharpen this broad range of knives to such extremely sharp and precise results. The Work Sharp Knife & Tool Sharpener Ken Onion Edition also sharpens common household scissors to a 60° angle with no set up time. Just place the scissor blade in the guide and pull –it is fast and easy to restore your household scissors back to like new performance. 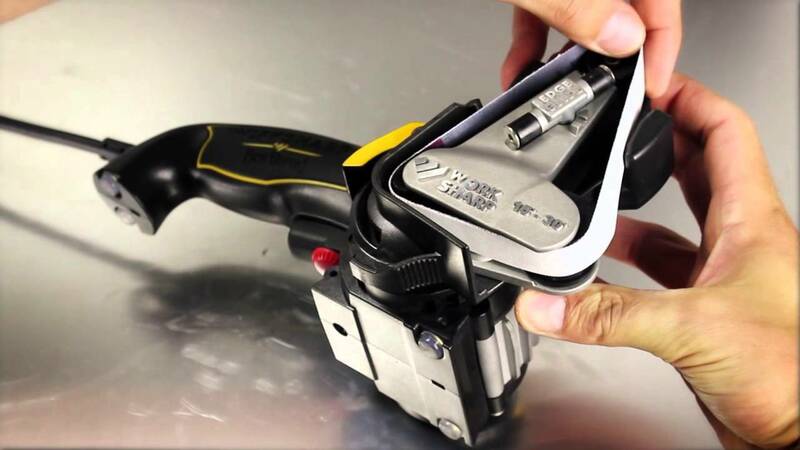 Light duty tool sharpening tasks can also be performed with the Work Sharp Knife & Tool Sharpener Ken Onion Edition. Quickly rotate the sharpening cassette to re-edge a wide range of common shop and garden tools such as shovels, pruners and more. The precision, versatility, and durability of the Work Sharp Knife & Tool Sharpener Ken Onion Edition make it an invaluable tool for keeping all your blades in razor sharp condition. Designed with cast metal and engineered polymer components, this tool is designed for serious work and is built to last. Darex, the makers of Work Sharp and Drill Doctor is proud to be an American company! This tool was built by hard working Americans at our family owned business in Ashland Oregon. For more than 40 years, Darex has been building premium sharpening tools right here in the USA. We employ over 70 people and have sold more than 3 million sharpeners.